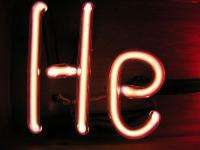 Image of a helium filled discharge tube shaped like the element's atomic symbol. Image: Pslawinski/ Wikipedia. Professor of physics, Robert Richardson from Cornell University in Ithaca, New York, won the 1996 Nobel prize for his work on superfluidity in helium, and has issued a warning the supplies of helium are being used at an unprecedented rate and could be depleted within a generation. Liquid helium is vital for its use in cooling the superconducting magnets in magnetic resonance imaging (MRI) scanners. There is no substitute because no other substance has a lower boiling point. Helium is also vital in the manufacture of liquid crystal displays (LCDs) and fiber optics. In MRI scanners the helium is recycled, but often the gas is wasted since it is thought of as a cheap gas, and as such is often used to fill party balloons and as a party trick distorting people's voices when it is inhaled. Professor Richardson warned the gas is not cheap because the supply is inexhaustible, but because of the Helium Privatisation Act passed in 1996 by the US Congress. The Act required the helium stores held underground near Amarillo in Texas to be sold off at a fixed rate by 2015 regardless of the market value, to pay off the original cost of the reserve. The Amarillo storage facility holds around half the Earth's stocks of helium: around a billion cubic meters of the gas. The US currently supplies around 80 percent of the world's helium supplies. Richardson said it has taken 4.7 billion years for the Earth to accumulate our helium reserves, which we will have exhausted within about a hundred years of the US's National Helium Reserve having been established in 1925. The reserve is a collection of disused underground mines, pipes and vats extending over 300 km from north of Amarillo into Kansas. He warned that when helium is released to the atmosphere, in helium balloons for example, it is lost forever. There is no chemical way of manufacturing helium, and the supplies we have originated in the very slow radioactive alpha decay that occurs in rocks. It costs around 10,000 times more to extract helium from air than it does from rocks and natural gas reserves. Helium is the second-lightest element in the Universe. Among helium's other uses include airships, air mixtures used in deep-sea diving, cooling nuclear reactors and infrared detectors, and in satellite and spacecraft equipment, and solar telescopes. NASA also uses massive amounts of helium to clean fuel from its rockets, and because the helium is so cheap, it makes no effort to recycle the gas. As the isotope helium-3, helium is also used in nuclear fusion research. Professor Richardson was co-chair of a US National Research Council inquiry into the coming helium shortage. The report recommends the US reconsider its policy regarding selling off the helium. I would rephrase the part "There is no chemical way of manufacturing helium" to "There is no chemical way of manufacturing helium YET". People are very industrious and will find a way when the need arises. You obviously have no idea what helium is CreepyD. If it were possible to manufacture helium conversely it would be possible to manufacture gold. It can be done with nuclear reactions, but not in any large quantity or low cost. Its physically impossible to manufacture more helium from chemical processes, CreepyD. It requires nuclear reactions to produce one element from another. Such as the fusion of hydrogen, or the fission of heavier elements. There's a minute sliver of hope that we may achieve sustainable fusion reactions in the next 25 years, but fissioning atoms to create helium would be a horribly pricey exercise in abject desperation (because of the energy required). It is possible to manufacture gold, btw, it's just very expensive (again, mostly because of the energy required). Would they not just start to mine comets/gas giants once all the helium runs out? They do mention possible extraction of atmospheric helium, as well as the exorbitant cost of doing so. If and when helium becomes much more expensive, I wouldn't be surprised that users, such as MRI manufacturers, will find alternative solutions to manufacturing MRI machines. "If and when helium becomes much more expensive, I wouldn't be surprised that users, such as MRI manufacturers, will find alternative solutions to manufacturing MRI machines." Finding alternatives to using helium in party balloons may be faster, cheaper and more effective. They also use helium in NDI (non destructive inspection) tests of aircraft. The helium molecule is so small that any cracks in the metal, the helium will escape through the crack even if it is microscopic... I couldn't tell you what device they use to detect the leakage though. Adjusting the US government's selling price up to market value would probably fix the problem, as well as pay for continued extraction of He from natural gas to replennish supplies. I think that was the real point of the initial press release and the report it refers to, (before Physorg's fearmongering headline gremlin got hold of the story). Good enough reason to set a deadline for achieving sustainable fusion. @GSwift7 Maybe you're right, but the fact is that we're just using He in so many industry and research applications that the demand is fairly inflexible. Probably a price jump would help prevent helium party balloons and other wasteful uses of the source, but in general it would drive up the cost of Research, Medicine, and Industry dramatically. LHC itself consumes one percent of helium produced by Russia annually, about 5% of the annual US consumption of helium for cryogenics. All the magnets are be pre&#8209;cooled to -193.2°C (80 K) using 10 080 tonnes of liquid nitrogen, before they are filled with nearly 60 tonnes of liquid helium to bring them down to -271.3°C (1.9 K). Roughly 20% of helium installed at LHC are wasted annually due the various leaks - no matter whether LHC is actually running or not. Just another example of how wasteful a free society is with a non-renewable resource. Guess what's in that floating balloon you just bought your kid? Guess why. Because some idiot did or would sue someone if they bought a balloon filled with hydrogen and burned themselves through their own stupidity. And because since we don't have realistic pricing for some things, like helium, someone can sell it to fill balloons. Also, better superconductors use liquid nitrogen so there is a substitute for super conducting magnets, just not for the magnets that already need helium. The superconductors capable of cooling with liquid nitrogen have low maximal current density, they're brittle, etc.. After all, this is why they're not used in LHC. The free market is the answer to every "shortage" problem. A little online research shows there are many companies extracting He from natural gas, constantly creating new supply. He extraction is a very large business, hundreds of millions per year. I would guess the great increase in natural gas supply because of improved drilling technology will make additional He available. The world is not running out of anything. Where things get tight, substitutes are found. Read Julian Simon, Bjorn Lomborg, Indur Goklany and Matt Ridley. Ok, man I want to see how you will give to your little child a baloon filled with hydrogen! Kids are kids how you will expect not to harm themselves, it is like to give them a real gun and not to expect something bad to happen. Why do the baloons have to float in the first place? I didn't get floating baloons as a kid and it didn't stunt my development. Why do the balloons have to float in the first place? Only underdeveloped kids can put such question. Floating balloons are amazing. Maybe when compared to eating crayons. Introducing the Alizee diet plan, 1 box of crayola a day. There is no chemical way to produce helium. That is correct. But there is a way to manufacture helium and I think that we have good reasons to adapt this way. And the real reason is that cold fusion, which produces helium as a byproduct, has other benefits that make it worth pursuit. And that is practically pollution free energy. And as a side effect one can collect the produced helium to help with this shortage. So one's waste is others needed resource. Most helium was mined and it often comes out of natural gas or petroleum drilling. So, once helium gets to a certain price, companies with drilling rigs will probably spend more time/money filtering the helium out. And at a certain price point, most devices using helium will probably start including capture systems instead of letting it escape. Space... the final frontier... 150 mio km away from earth there are a bulk of helium called helios... can we use that source? I'll park the ship in orbit next to Mercury and lower you down on a rope. Hose up as much as you can before you catch fire. Sound good? Hydrogen filled balloon will not burn anyone, because the hydrogen atoms are so small. The atoms will escape the balloon in a few microseconds and they travel in a stright line up. The tiny flash-line will be so fast you might not feel it, but you also might not see it even in the dark. Slower gases linger. Pretty simple really, if the kid is young he'd be supervised and not given matches or he'd just get a balloon filled with air. If he is old enough to play with matches I would show him how not to get hurt. "Hydrogen filled balloon will not burn anyone..."
I guess if the Focus Fusion experiment succeeds then cheap energy and helium availability would be solved. Balloons could be filled with Neon instead, it may have only half the buoyancy, but should still work fine. It should be cheaper to get neon from air than Helium. That's the problem. We very well could run out of helium prior to achieving fusion. Which would immediately cease all particle accelerators and fusion experiments at least as long as it took for us to determine a new method of cooling. Once I learned the statistical mechanics description of the gas laws (1980's) it was immediately apparent helium was a very limited and finite resource. Once it is mined it is single use only and escapes from Earth in a blink of an eye the moment it's used. Last year I helped a friend organize a birthday party for one of her daughters and she ordered a dozen helium balloons. I explained the consequences and maybe that was the helium her child would need in 50 years for her MRI. Her answer was "Ya, but what can I do?". She bought the helium anyways and the children let it free because that's what kids do. I felt bad for mentioning it because it made her feel bad without saving any helium for the future. I learned you have to let the parent know well in advance of any decision making. Because for most people all decisions are final and new news that can change that decision only adds discomfort. there is already an alternative: air. You can fill up balloons with air fro your lungs!!! AWESOME! They dont go up, thats true, but kids still can play with them, because they fall slowly. We can make H3, tritium. Tritium has a short half-life. One of the decay products of tritium is He3. Of course, we could have been siphoning off the He3 produced by all our Nuclear warheads, and stored it, but I do not believe we did. Couldn't they just bombard alpha particles with cathode rays to produce helium? What is Helium being converted too ? Or in what chemical way is it being consumed ? We may be running into the limits of our ability to extract Helium from the atmosphere but we are not "Running out of Helium" Last time I looked, Helium was an inert gas. We cannot consume it destructively. True, but the fact that it is so light and such a small atom means that once released into the air, it rises up and out of the Earth's atmosphere and is then lost. "They also use helium in NDI (non destructive inspection) tests of aircraft. The helium molecule is so small that any cracks in the metal, the helium will escape through the crack even if it is microscopic... I couldn't tell you what device they use to detect the leakage though." The device is a helium mass spectrometer leak detector which is rather common in manufacturing things that must be leak tight. I used one to check welds and brazes on radiation detectors I made for 25 years. Some of them, used for analyzing fast neutron spectra, required helium-3 which, I read, is in very short supply indeed. "Of course, we could have been siphoning off the He3 produced by all our Nuclear warheads, and stored it, but I do not believe we did." The source of this was the beta decay of tritium which came from the nuclear weapons program. With the START program, these went into short supply and the gas is in short supply and very expensive. This material was collected and used. wow I had no idea of the status of helium, precisely because it is kinda cheap. I thought it was nearly as available as hydrogen etc. The word needs to get out broadly. Add helium conservation to the 'green' list lol. yeah that price fix needs to go, and alternatives found/created whenever plausible.